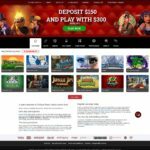 Fortune Room Casino is an online casino including mobile and live dealer games, established in 2008 using games powered by multiple software providers. It is operated by Digimedia Ltd and is licensed under the jurisdictions of Malta and Kahnawake. Customer Support 24/7/365 in multiple languages. Fortune Room Casino, as the name suggests, is destined to bring luck to the players. The casino has a reputation in the market for having one of the best services for its customers. Digimedia group is the owner of the casino. It is one of the 11 owned by them. The casino is known for a wide range of games and promotions. Both Digimedia and Fortune Room are licensed by Malta Gaming Authority. 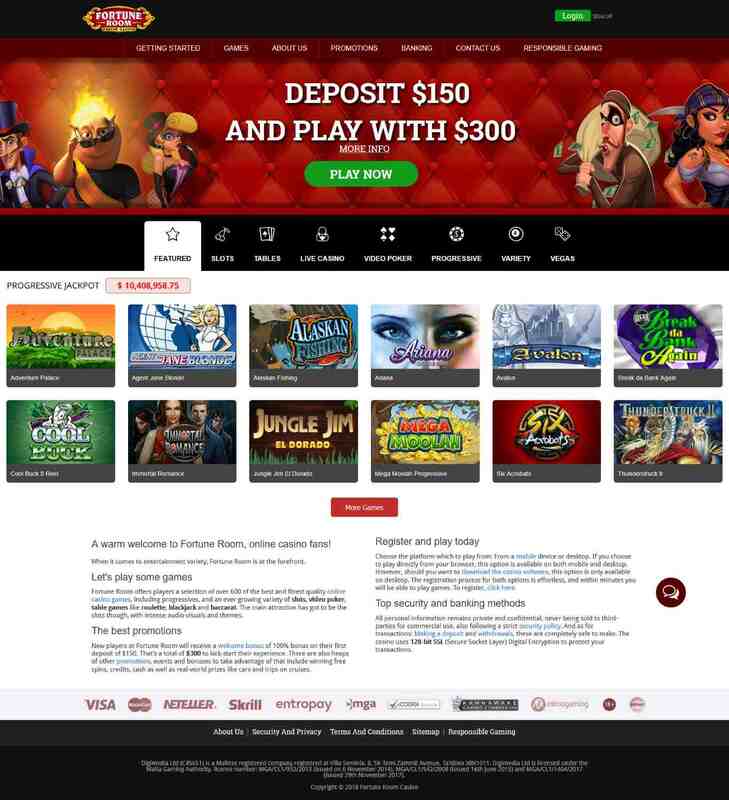 The casino site layout is easy and user-friendly. All the games are sorted by sections. Other options like About Us, Banking, etc are also present for customers’ ease. Fortune Room Casino does not accept players from the following countries: Netherlands Antilles, Australia, Belgium, Curacao, Czech Republic, Denmark, Spain, France, United Kingdom, French Guiana, Alderney, Guadeloupe, Hong Kong, Hungary, Israel, Italy, Martinique, New Caledonia, French Polynesia, Saint Pierre And Miquelon, Palestine, Reunion, Romania, Singapore, French Southern Territories, United States, Virgin Islands, U.s., Wallis And Futuna, Yemen, and South Africa. On its launch in 2016, the site sported an astonishing variety of 300+ slots. These slots divide into Arcade, Reel, and Video sections. Microgaming provides all the games for the casino so customers will not have to doubt their standards. The variety is endless. The famous slots include Cool Buck 5 Reel, Thunderstruck, Ariana, and Adventure Palace. The slots are instant play without any download. They are also available in two modes; a fun mode and a real money play. This is so players can try out the game first before investing their money. The casino also has a generous welcome bonus for new players. On first deposit of minimum €150, players will get a bonus of another €150. This means on their deposit, they get to play double their investment. However, the bonus has terms and conditions which include minimum wagering requirements before the bonus can be withdrawn. Fortune Room also offers a wide range of Live casino and Virtual Table games. These games are not available in demo mode so the players will have to log in and access them through their accounts. As reviewed by customers, the games are quite energetic and exciting. They offer a nostalgic experience for players who previously played real-life casino. The Roulette includes American, European, and French version as well as Premier Roulette along with others. Some Blackjack titles include Atlantic City, Classic, and Vegas Strip Blackjack. Table games also include Keno and Super Bonus Bingo. The website is easy to access and games can be played without much trouble. The desktop version is smooth with good graphics. The site is also available on mobile browsers. They are available on any operating software mainly iOS and Android. The mobile version is just a smaller desktop version without any compromise in gaming performance. The games are also downloadable for easy access any time of the day. With instant play and smooth graphics, the gameplay experience becomes much better especially if the players are winning. The sound effects are just as good as the gameplay on mobile devices. There are many ways customers can contact the support staff. The staff is very helpful and responds fast to inquiries with detailed help. The can be contacted through live chat which is mostly used for small in-game problems. The casino also offers Whatsapp and Skype chat with agents for a more detailed conversation regarding the issue. Not only that, but players also have an email option. They can expect reply minutes or days depending on the issue but they are helpful nonetheless. The casino uses the modern 256-bit SSL Encryption to protect its databases and customers personal and transactional information. As stated on their website, the casino protects information in various ways other than encryption. Using Firewall system and intrusion prevention, the site prevents cyber attacks on the site. Authentication and access control also ensures no individual account was hacked. With such protection, the casino also offers various banking options to its customers. Players can pay through eWallets, debit or credit cards as well as a bank transaction. All the payment methods are free and fast. The games are also tested for fairness by external and internal authorities like eCOGRA.